Everyone loves molten cheese on a pizza, but do you know what’s even better? An edible bread bowl filled with gooey cheese and runny egg yolk! Say hello to Khachapuri – the Georgian take on cheesy pizza! A few weeks back I was talking about possible vacation destinations with my Russian colleague. She mentioned that Georgia is an awesome place to visit. No, not Georgia the US state, but Georgia the country in the Caucasus between Russia and Turkey. Though I haven’t been there yet, I read about their national dish – the Khachapuri. It’s a boat-shaped bread filled with molten cheese and topped with an egg. You break pieces off from the side and just dip them in the gooey goodness. A delicious edible bread bowl! For the recipe I used my easy pizza dough recipe in which I simply replaced half the water with milk. If you are in need for a quick fix, you could even go for ready-made store-bought pizza dough. Get going and enjoy some gooey cheese in a crunchy edible bowl! Combine all ingredients except the cheeses and eggs in a bowl. Mix well with a fork. If the dough is too dry and not all flour is incorporated, add a tablespoon of water. If it’s too wet and keeps sticking to the sides, add a tablespoon of flour. Mix with your hands until a nice smooth ball of dough forms in your bowl. Let the dough rise in a warm place for 1 hour. Preheat your oven to 220°c (fan works best for a crunchy crust). Cut the dough into 2 even pieces. Sprinkle some flour on your kitchen counter and on top of the dough. Roll out the first piece of dough with a rolling pin (or a wine bottle). Roughly aim for a round shape with 20cm diameter. Roll up the sides of the circles to end up with a boat-like shape and pinch the corners together. Repeat with the second piece of dough. Line a baking tray with parchment paper and transfer the two boats onto it. Pat your mozzarella and feta dry with a kitchen towel. Grate both cheeses into a bowl, mix to combine and fill the boats with the cheese mixture. Beat 1 egg in a small little bowl and brush the rim of the boats with the egg-wash.
Bake the Khachapuris in the oven for 15 minutes until nicely browned. Fetch them out of the oven and make an indention in the middle with the back of a spoon big and deep enough to hold a whole egg. Break an egg into each indention and put the boats back into the oven. Bake for another 6 minutes at 220°c. The egg-white should be mostly set, if it’s still runny, let the Khachapuris rest in the hot oven for another 5 minutes. Garnish your edible cheese boats with some dill or spring onion and serve immediately! Let us know in the comments what you think about the recipe! Have you ever had Khachapuri before? 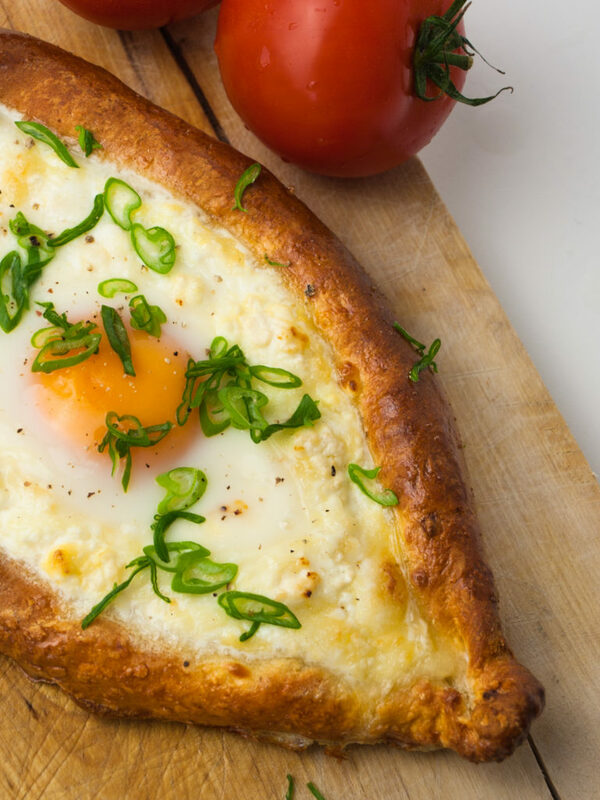 Each region in Geogria has a different style Khachapuri, and the version described above is from the Adjarian region. Have you tried the other varieties and like them even better than this one?